Walking and weight loss are like love and marriage. It’s hard to have one without the other. Walking works so well on a diet that it is the most recommended exercise prescribed by physicians at weight loss clinics. It is possible to lose weight without walking but many times sustained weight loss comes with exercise and that normally starts with a simple walk each day. Walking is an excellent exercise that most everyone can do and doesn’t take a lot of motivation. 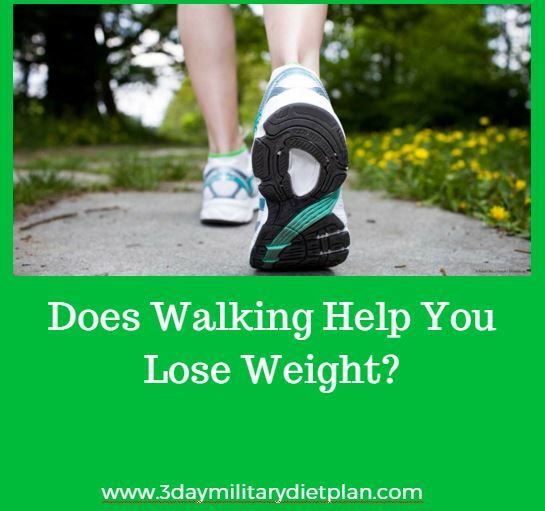 We are often asked questions about what type of exercise we should be doing on the 3 day military diet plan and how does walking help you lose weight. The answer is walking helps with many aspects of your life and weight loss is just one of them! Walking is great for you at all stages of life and is a great tool on the military diet because it is low intensity. But just like all diets and exercise routines you must stick with it for it to work. In order to lose weight you have to either cut back on calories or start burning more calories. Many dieters don’t think that walking burns many calories because it seems effortless. You can certainly burn up to 100 calories a mile walking if you weight 180 lbs. (it’s about 2/3 that for a 120-pound person). That might not sound like much it is very comparable to running. The fact of calorie burning is that most of the calories are burned by your body just keeping up its natural life-sustaining activities. Your body uses calories to breath, pump your heart, digest food, get nutrients to your cells, etc. This is called the Resting Metabolic Rate, and it accounts for about 60 percent of the calories you burn each day. If you’re an average person, you need to eat between 1,000 and 1,400 calories per day to keep your heart beating. Does walking help you lose weight just because of the calories burnt? – No. Walking will raise your metabolism and burn calories. But it will also build muscles that need to be “fed” throughout the day by your body. Some studies show that many calories are burnt hours after the workout. Walking is one of the easiest exercises available. Just about anyone can walk. Even small children have little trouble walking several miles a day. One of our most successful challenges as part of our weight loss plan is challenging our dieters to walk 5 miles a day. We don’t recommend you walk 5 miles a day while on the 3 day plan. You may not have the energy for that. But on the 4 days off we challenge you to walk 5 miles a day. It is simpler than you think. The hardest part about walking 5 miles a day is thinking about it. Walking works for weight loss. Just make up your mind you will do it. You’ll be surprised how easy it is once you’ve decided to do it. It takes less time than you think. Walking a mile will normally take the average person 20 minutes. 5 miles will take approximately 100 minutes or 1 hour and 40 minutes. While you are walking 5 miles a day you can listen to music, talk with a friend (in person or on the phone), catch up on podcasts, enjoy nature, have time to your self, etc. You will find quickly that your daily walk will be the most enjoyable part of your day. You don’t have to set this time apart to just walk. You can incorporate it into other parts of your day. You have to go to the grocery store for just a few items? Put on a backpack to carry the items home and set off on foot. Have to drop your books off at the library? Grab your walking shoes so you can enjoy outside for a bit. You’ll save money on gas and feel much better about yourself. You should commit to walking 5 miles a day even if the weather isn’t bright and warm. My absolute favorite time to walk is when it is a little chilly outside. The air is crisp and fresh. The world seems more vibrant. I don’t walk when there is a storm or a hurricane outside but not much else can stop me from walking. For some walking will seem like a challenge. But once you get started it will be hard to stop you. You will burn up to 500 effortless calories, lose weight, and love the process of doing it. Does Walking Help You Lose Weight If You Only Walk a Little? Rome wasn’t built in a day and either is your walking work out. I realize some will be intimidated by the walking 5 mile a day challenge. We all have different bodies and we all start from different places/ages/weight/circumstances. If you can’t walk 5 miles a day start with 3. If you can walk 3 miles a day start walking 1 mile. If you can’t walk 1 mile a day start by walking up the stairs a couple of times a day. You need to start somewhere and you will be amazed at how quickly you will progress. When you start walking you will begin burning calories and see yourself losing weight. With added weight loss your walking becomes easier each day. Of course your muscles will build and you’ll have the added bonus of a leaner body and stronger muscles to keep your body a walking machine. But we do highly recommend that you start out small. You may want to start for a just a few build up to where you can walk for 30 minutes a day with no problems. If this takes a couple of weeks or a couple of months it is still progress! We realize that not everyone can walk a few miles every single day. And If you can’t walk everyday try walking five times a week or maybe every other day. The thing with walking is that the more you walk the more you will feel inclined to walk. Give it a try but don’t overdo it especially in the beginning. Many get motivated to lose weight and lose weight fast. We mentioned above how you shouldn’t walk 5 miles a day if you are on the 3 day diet. But just as importantly don’t push yourself too hard. Working out too hard makes it harder to work out the next day. And that is the last thing we want to do. Leave a little in the tank for the next day. We are going for consistency. Because you could easily end up hurting yourself you don’t want to overdo it when you first get started. It is also important to know that many people start walking but then fail to see it through on a regular basis. You have to start walking on a daily basis or every other day if you want it to be effective for you. There are some different ways that you can use to help you stick with your walking schedule so that you keep the weight coming off and staying off. There are many benefits to walking and we have established that walking does help you lose weight. If you can’t get fully behind the 5 miles a day challenge then you should at least try for a mile or two. Think of the effortless calories you can burn by walking the dog an extra mile or two a day. It won’t be enough calories to burn off that extra donut you had at the office on Friday. But we already know that you can’t out-exercise a bad diet. Walking does work for weight loss and may be one of the best ways to to burn fat but it also may be on the most effective ways to boost your mental health. Here’s a chart to show just how fast you can jump start your weight loss by walking. The chart is based on taking 20 minutes to walk a mile. Does Walking Help You Lose Weight or Do You Need Something Harder? So many ask does walking help you lose weight that we just have to think. Walking and weight loss are two things that have worked well together in the past. Walking and weight loss have worked so well in the past that our ancestors used to not be able to keep the weight on! Walking is an excellent exercise to help you start losing the weight you want very easily. However you must stick with it for it to work. Does walking help you lose weight or just it just help muscle is the real question. I think the answer is pretty clear. When you walk you are raising your metabolism and burning fat. That is what is needed in order to lose weight for anyone. Plus walking is one of the easier exercises that anyone can do not matter your age. The elderly, those with mobility issues, even children have no problem walking. And if you are on a diet like the 3 day diet it best not to overdo things. It’s all about small victories when losing weight. Walking is a low impact exercise and there’s not much better for you to lose weight.. As you can easily see with a little research walking is the foundation for any weight-loss program. We think that it is best if you start out small and increase your walking until you can walk for 30 minutes a day with no problems. You want to do this five times or more a week for the maximum results possible. But just like all things, don’t overdo it. You could easily end up hurting yourself you don’t want to overdo it when you first get started. It is also important to know that many people start walking but then fail to see it through on a regular basis. So you can be sure that you use this exercise regularly without wanting to give up here are a few things you can do to make walking more fun. Giving up is the best way to never lose weight so find a way so that you don’t give up. 1) Listen to music – Take your, Ipod, phone, or MP3 player and listen to music while you walk. This will help the time pass much quicker and give you something to think about besides the walking. 2) Walk with friends – This is a good way to enjoy yourself while walking as well is keep motivated about maintaining your schedule. 3) Only make yourself walk for 10 minutes. That’s what you tell yourself when you leave the house. If you want to come home after 10 minutes then you can. If you feel like you can do more that day then great. 30 minutes is ideal but sometimes we can burn up all our willpower. These are just a few way ways to make walking more enjoyable. The important thing is to find a way to make it more fun for you because sticking with it is required if you want this exercise to be effective for helping you lose weight. Walking and weight loss will always go hand in hand because that is the best way to lose weight quickly. Anyone can walk on a regular basis if you just find a way to make it more enjoyable so start today and before you know it you will see the weight loss results you desire. So let’s get committed to spending a little extra time walking each day. It may be just as simple as taking the stairs at work instead of the elevator. Walking each day pays huge dividends! Walking absolutely does help you lose weight. It also helps you clear your head. I can almost guarantee that the great thinker of the ages were walkers.